E Minor God presents Noche de Los Psychos featuring Germany’s psychobilly mad men, Mad Sin. With support from The Triggers, The Howlers, Bamboula and Graveyard Drifters, get ready to get psycho and rock and roll til you die! Tickets to the show are $20 in advance, show starts at 7:30 p.m. and the show is all ages. Thanks to our friends at the Echoplex we have some tickets to give away! You must have a Twitter or Facebook to enter the contest. First make sure you’re following Grimy Goods on Twitter here and/or “like” our Facebook page here. We’ll pick winners by Monday, Oct 10. The winners will be direct messaged on Twitter or contacted below their contest entry comment on the Grimy Goods Facebook page. Winners will have until noon Tuesday, Oct 11 to claim their win or the tickets will be forfeited. To increase your chances, enter the contest both ways! Via Twitter: Tell us why we should hook you up with tickets! Send your Tweet to @GrimyGoods, mention Mad Sin and be sure to include the following hashtag in your Tweet: #ContestMS. Via Facebook: Just leave a comment on the Grimy Goods Facebook page telling us why we should hook you up with tickets. 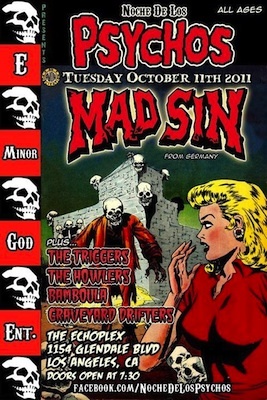 Also, be sure to mention Mad Sin at the Echoplex so we know which contest you’re entering! This entry was posted in Giveaways and tagged Bamboula, contest, giveaway, good music, Graveyard Drifters, Mad Sin, Noche De Los Psychos, sweepstakes, The Echoplex, The Howlers, The Triggers, ticket giveaway, tickets contests on October 10, 2011 by Emily Saex.